Pongal is a famous Indian festival . 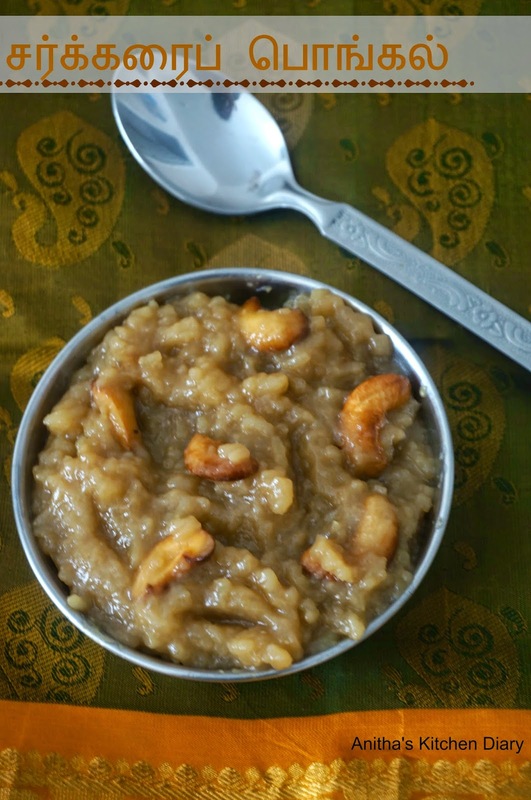 Its a harvest festival and thanking sun god.In Tamil the word "Pongal" means "Overflowing" which signifies abundance and prosperity .This sakkari Pongal or sweet pongal is made out of the freshly harvested rice, cooked with jaggery and ghee. Dry roast the moong dal and keep aside. Pressure cook the rice along with dal, salt and water.Once it done mash it well. Heat the powdered jaggery with water just to immerse level.Bring it to boil and let all the jaggery dissolve in water. Strain it with the filter to remove impurities .Add it to the rice and cook well in a medium flame.Add 1/2 cup of milk or water if its dry while cooking. In a separate pan heat ghee , fry the cashews and raisins . Pour it over the rice ,add cardamom powder and mix well.